I have 2 buckets full of 2.5″ strips. In an effort to use up some of those strips, I started cutting out a new quilt last week. 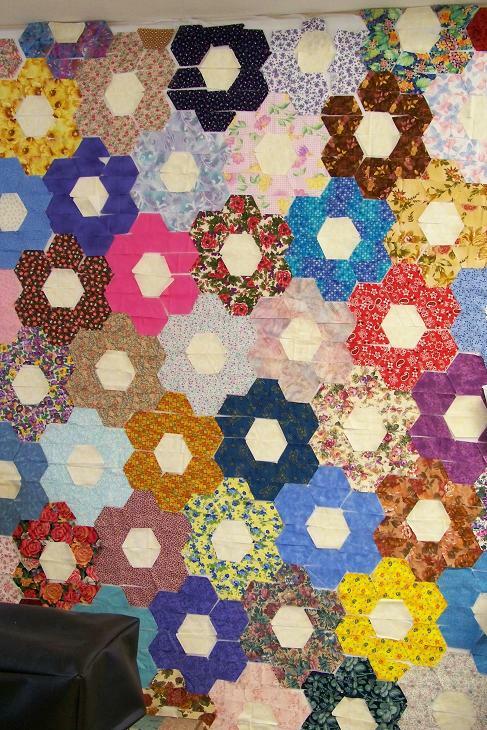 This is the quilt all laid out on the design wall. The entire wall is now covered, and it never made a dent in the buckets of strips. I started sewing the pieces together today. It is brainless sewing, since I used a template for the half hex. I finished listening to Prayers for Sale while sewing. Not my favorite book, but not awful either. Next up to listen to is The Glass Castle. I may start it tomorrow. Or not. Sometimes, I need a day or two between books. For some reason, I like to let the finished book “settle” before I start the new one. Same is true for movies. We watched Precious last night, and that will take a week or so before it “settles”. Yesterday I had a half day to myself. I went ALONE…. yes, ALONE….. to the local quilt shop to do a little retail therapy. (My friend Kay S. says I was doing my civic duty by boosting the economy!) I spent 2 glorious hours finding the fabrics I need for a new project that is spinning in my head. I got a new book last week, and I am revising one of the patterns in it to make it the way I need to. It is only the 2nd time I have ever bought oriental themed fabric. I normally don’t like it. But isn’t this one yummy? And the first 4 fabrics in the top left corner are Fairy Frosts. Those are the accents in the quilt. I have to get that Scrap Garden off my wall so I can this new one up! The new one will be time consuming. Much more difficult piecing and layout. Lots of planning. I hope the effort is worth it. love the scrappy garden! and i loved prayers for sale. sometimes for me, how much i like a book is influenced by the things going on around me. Kay, I agree about things going on around me. I just wish the book had more depth. I like books that make me think. It really didn’t. drool, drool, drool …….. wipe, wipe, wipe …… oh golly gee!! I love those new fabrics ….. oh golly !! Since I started the genealogy kick, I haven’t read an entire book ! I am “working” on Andre Agassi’s “Open” … which Hubs read in two days and of course is now 6 or 8 books ahead of me. But I am doing some cute quilt tops … one called “Duck, Duck, Goose” which is my first stab at machine applique; and now two sweet baby quilts for my niece who is having fraternal twins from in vitro … one of each. I love your GMFG from scraps … my scrappy tries always look .. well, crappy !! Now why the heck am I posting this on your blog? DUH …….. I love your Oriental … but you know how I am with those. This one is particularly pretty. You go girl!! Love the GMFG, Gayle…don’t you know that the more of your stash you use, the more it regenerates?! 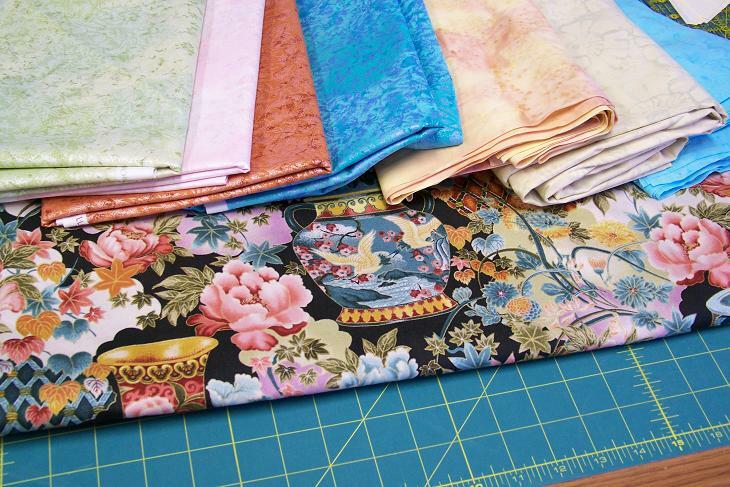 Oh, I can’t wait to see that Asian fabric translated into a beautiful quilt. I’ll be following that one.